School: Seirin High Number: #4 Position: Shooting Guard Height: 5' 10" (178 cm) Weight: 149lbs (68 kg) Age: 17 Blood Type: A Birthday: May 16th Position: Shooting Guard Talent: Clutch Player, Shooting Sophomore and Seirin basketball club's captain. His specialty is 3 pointers, and can shoot accurately even if under extreme pressure. He's the team's clutch during tough situations. Hyuuga really likes to collect ancient Japanese warrior figurines (ex: Masamune, Yukimura, etc) and treasures them a lot. He got the skill to shoot accurately thanks to his special training, in which when he missed a shot during practice, he had to break one of his figurines. Hyuuga normally has a pleasant personality, but gets arrogant when irritated. When Hyuuga was in middle school, he was also on the basketball team together with Izuki. Unfortunately, the team was very weak. Despite Hyuuga's shooting ability, they never won once. 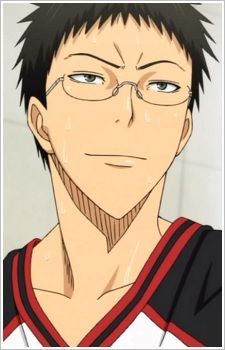 Hyuuga was discouraged and decided to quit basketball when going to high school and also dyed his hair blond. But he was touched by Teppei's seriousness on forming a basketball club, and he finally joins the team. Then due to Teppei's suggestion and everyone's approval, he became the team's captain.